Non-Destructive Testing (NDT) is the use of special equipment and methods to learn something about an object without harming the object. One of the NDT methods commonly used is called Magnetic Particle Inspection. This process used for detecting surface and slightly subsurface discontinuities in ferroelectric materials such as iron, nickel, cobalt, and some of their alloys. The process puts a magnetic field into the part. The reason we use this test is to find small defects in objects before they become bigger defects and cause serious problems. The reason we use this test is to find small defects in objects before they become bigger defects and cause serious problems. 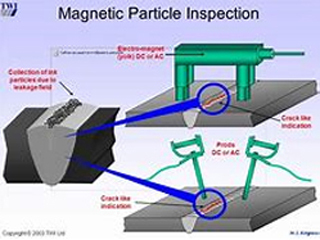 In magnetic particle inspection, a magnet or electrical current is used to establish a magnetic field in the object. Iron filings are then dusted on to the surface of the object. The filings should align along the magnetic lines of force. If a crack or other defect is present, the magnetic fines of force will be disrupted and the magnetic particles will cluster along the edges of the flaw.